The job of building and maintaining the state’s transportation infrastructure carries a very big cost. Our research aspires to help inform the policy decisions that will determine how best to manage that cost. Brianne Glover is an Associate Research Scientist with the Texas A&M Transportation Institute and Manager of the Infrastructure Investment Analysis Program. She is an Attorney and Counselor at Law, licensed to practice in the state of Texas. She has been involved with numerous research projects within the Infrastructure Investment Analysis Program and the Mobility Analysis Program that focus on transportation financing as well as the economic impacts associated with transportation improvements. Dr. Glover has testified before the Texas House of Representatives Transportation Subcommittee on Long-Term Planning regarding finance options as well as future funding needs. Dr. Glover's main focus is the maintenance and future development of the Transportation Revenue Estimator and Needs Determination System (TRENDS) model. 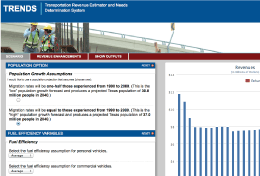 The TRENDS model is designed to provide transportation planners, policy makers and the public with a tool to forecast transportation revenues and expenses based on a user-defined level of investment at both the state and local level. She has also developed an economic impact assessment tool that produces economic and mobility results at the MPO level. Other projects include benefit- cost analyses for TIGER grant applications, economic impact assessments for both the public and private sector, and on-call research support for the Texas legislature regarding financial tools and forecasts, as well as economic transportation topics. While pursuing her Juris Doctor degree she interned with the State of Texas and Brazos County. Before attending law school, Dr. Glover worked for a local civil engineering firm that specialized in roadway, utility, traffic control and drainage design work for local city and TxDOT projects. Dr. Glover is a member of the State Bar of Texas, American Bar Association, and the State and Local Government Law section of the ABA.